What does a Computer Virus do:- Computer Virus ( Vital Information Resources Under Seize ) is a program that is created intentionally to corrupt or deletes data stored in a computer by erasing information available on its hard disk. Once a Virus becomes active, it starts getting loaded saved in Computer memory. It's travel to the hard disk and system It can spread from one Computer to another due to the use of CD-ROM, Pen drives, E-Mail messages, Social Media Handles, etc. 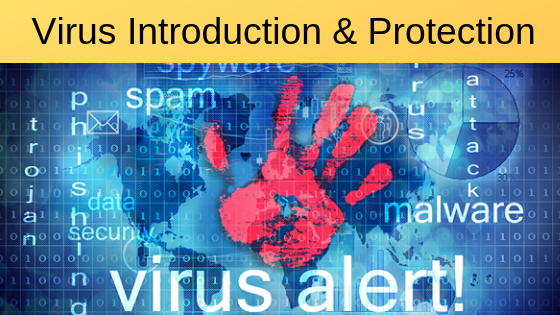 Types of Virus:- There are many types of Viruses and different people may describe them in different ways. Let,s Know about some of the specific categories of Viruses. Polymorphic Viruses:- Polymorphic Viruses alter characteristics when they infect a Computer. These viruses are very difficult to detect by scanning because of each copy of the virus taken various characters and forms the other copies very fast. The goal of this virus is evasion. It is harmful to computers. Stealth Viruses:- In Computer security, a stealth virus is a computer view. That uses different mechanisms to avoid detection by antivirus software. Fast and Slow Infectors:- A fast infector is a virus that, when it is active in memory, infects not only programs that are executed but even those that are merely opened. The term " Slow Infacters " refers to that virus which infects files as they are modified or created. Armored Virus:- These viruses are programmed to make eradication hard. Special "Tricks" are used by these viruses to foil anti-virus researchers. Multipartite Virus:- A multipartite virus infects computer systems multiple times and at different times. In order to eradicate the virus, the entire virus must be removed from the system. Cavity (space filler) Viruses:- A cavity virus is one which overwrites a part of the most file, without increasing the length of the file. A cavity virus attempts to install itself inside of the file it is infecting. Tunneling Virus:- A tunnneling virus that attempts to intercept anti-virus software before it can detect malicious code. Camouflag Viruses:- Camouflag viruses attempt to appear as a benign program. Their viruses have special protective mechanism to escape detection by virus scanning programs. Metamorphic Viruses:- The viruses which rewrite themselves completely each time are called metamorphic viruses. Virus Droppers:- These viruses represent a special category of programmes that place viruses on computers but are not by themselves an actual virus. Most of the virus program is designed to confuse and irritate the operators but other viruses can prove to be very harmful to a computer system. They can modify or corrupt files, delete data, steal passwords etc. They start injecting programme files in Word Processor, Spreadsheet Packages, etc. Where do Computer Virus come from? You are unable to access that a computer has been infected by a virus are the following. The Computer's hard drive constantly runs out of free space. Strange graphics are shown on your computer monitor. The floppy disk drive constantly runs out of free space. The floppy disk drive or hard drive runs when you are not using it. Computer Programs take a longer time to load than normal. Conventional memory is less than it used to be and you can't explain it. Strange sound or beeping noises coming from the computer or keyboard. Files have strange names you don't identify. Scan your computer on a regular basis.